Zippy Shell Chicago is pleased to announce our newest service offering for portable storage in River North. Call today and Zippy Shell moving and self storage in River North will deliver one of our Zippy Shells for moving straight to your door. Once youâ€™re done packing, we will also collect it and store it for you. 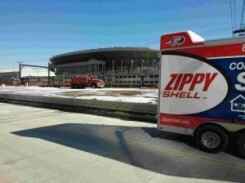 No one makes moving and self storage in Chicago easier than Zippy Shell! Zippy Shell Moving and Self Storage in Chicago will bring the storage container right to your door. We are the only street-legal portable storage company in the city of Chicago! Once we deliver a Zippy Shell, moving can be done at your own pace. You can pack as much as you like Ã¢â‚¬" simply let us know when youâ€™re done so we can collect it. Forget about renting moving trucks. Forget about fighting city traffic to get to your self storage space. We take the hard work out of storage Chicago. And when youâ€™re ready to get your stuff back, weâ€™ll deliver it straight back to your door as well! Do you want to know the very best part about portable moving and storage in River North? Our safe, secure storage solution is also the most affordable in the area! Let us prove it to you now. Contact Zippy Shell Chicago to see how little it costs and to arrange delivery of your portable storage unit today!